This whole book is basically a 517 page long account of Andie’s summer, from start to finish. And you know what? I did not mind the length of this story one bit. I cherished every dog walk, every pizza date, every movie night and every scavenger hunt. It was an ode to summer and how it should be spent, whether you’re a teenager or an adult. The heart of this story really is the relationship between Andie and her estranged father and how they get past their differences together. Their awkwardness together in the beginning of this book is so palpable and I loved watching it evolve over time. Another main topic in this book is the friendship between Andie and her three best friends: Palmer, Toby and Bri (all girls BTW). I loved how their friendship was portrayed and I loved how it was very realistic (even though at the beginning I was really worried about that). Each girl had her own distinct personality and still the group dynamic felt so very right. They were not perfect, they made mistakes and I even loved the fights (in that love to hate kind of way). Also, the text messages and the emojis cracked me up. Our main love interest is Clark, a homeschooled fantasy author. With a publishing deal and matching movie adaptations. He’s adorably awkward and cute and he’s pretty much every book lover’s dream guy. And even so, the relationship between him and Andie is still realistically written: there’s no instalove and there are awkward moments and miscommunication aplenty. And even though it was a realistically written romance, there were still plenty of rom-com elements in there. The ending alone was perfectly cheesy and swoon-worthy movie material. Did I mention there are lots of dogs in this book? Big dogs, small dogs, cute dogs, fluffy dogs. I’m more of a cat person honestly, but still, this book made me want a dog. I only have one nitpick and that is related to the friendship aspect of the story. I thought certain obstacles in the friendships were pretty predictable and I also did not like the fact at all that said obstacle was a guy. I wanted more of a ‘sisters before misters’ vibe and I was bummed I did not get that at all. Overall, I greatly enjoyed this book and I really, really would like to see this turned into a movie! 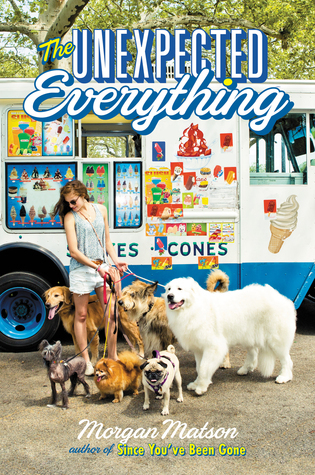 Have you read The Unexpected Everything? What did you think ABOUT IT?